The rivalry between Peyton Manning and the Patriots has a lot of history, and Julian Edelman added some fuel to the fire at the ESPYS. Peyton Manning did plenty of his own roasting while he was hosting at the beginning of the ESPYS on Thursday night, but it looks like some of the athletes at the show aren’t holding back on throwing their own shade. Of course, there were plenty of New England Patriots-centered jokes during the show, including a Tom Brady appearance during a sketch with Manning in a retirement home with Brady’s “grandma”. To throw some more salt on the wound, Patriots wide receiver Julian Edelman roasted Manning in his award acceptance speech. 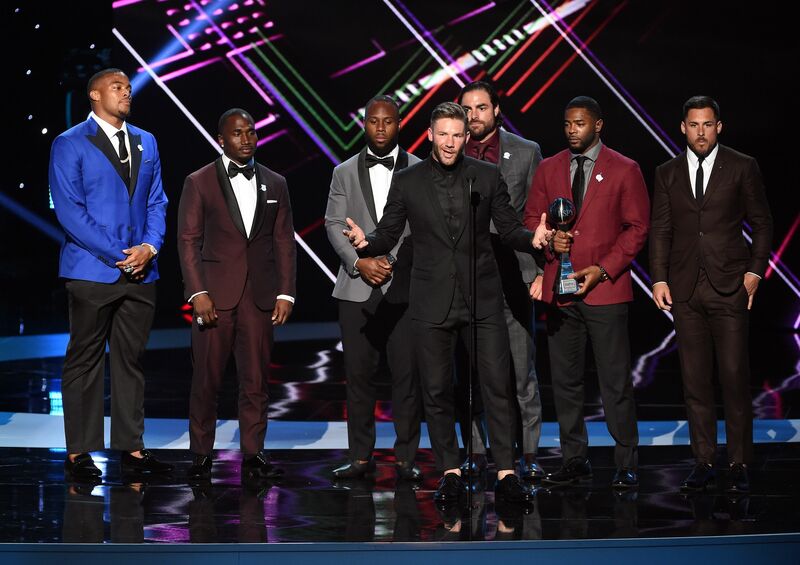 The Patriots won the award for the “Best Game” for their epic Super Bowl 51 comeback against the Atlanta Falcons, and Edelman did the honor of accepting the award and speaking on his team’s behalf. To open his speech, he shot some praise toward Manning, but then realized what the likely reason was for the night’s host’s success: where exactly they were. It was nice to see a nice jab back at Manning during the night, as he threw some shots of his own towards Kevin Durant that landed pretty hard in his opening monologue. It even got Russell Westbrook involved, in a rare double whammy to start out the show. Now, maybe Durant should just bring up how Manning played any time he showed up in a playoff game in New England throughout his career, and the two of them would be even. Until then, Edelman can stay the roast king, and even has the same amount of Super Bowl rings as Manning in case the future Hall of Fame quarterback tried to clap back.